Jacob Thompson was diagnosed with Stage 4 High Risk Neuroblastoma in February of 2014 when he was just 5 years old. Amazingly, Jacob is now 9 but the family says his time is limited and he won’t be leaving the hospital. Jacob was admitted to the Barbara Bush Children’s Hospital in Portland, Oregon, on 11 October 2017. Considering how little time he has left alive, his family plans to celebrate one last Christmas with him during the weekend. “Jacob loves Christmas” his father Roger Guay was quoted as saying by 11 Alive news website. Jacob’s hospital room will be decorated with a tree and lights and the boy will celebrate the festival with his family with some fake snow and a Santa Claus, his father said. The family has also started a fundraising page on GoFundMe. 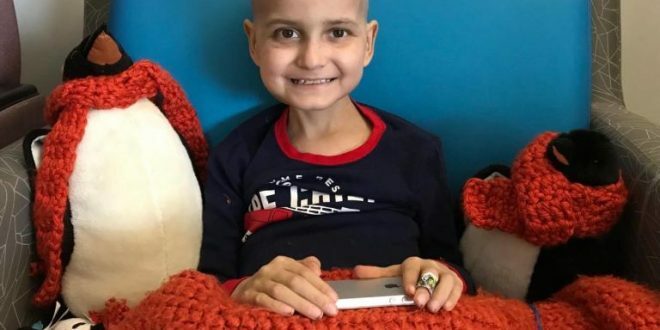 Jacob’s medical report states that the neuroblastoma has spread to his head — namely the sinuses, bottom of the skull, several spots in the small bones in the inner ear and several spots on the membrane between the skull and brain, says the GoFundMe page. A risk factor is something that increases the risk of developing cancer. It could be a behaviour, substance or condition. Most cancers are the result of many risk factors. But sometimes neuroblastoma develops in children who don’t have any of the risk factors described below. Neuroblastoma is the most common solid tumour outside of the brain in children. It accounts for 8%–10% of all cancers in children. About 80% of neuroblastomas occur before the age of 5, and the average age at diagnosis is 2.5 years. It is the most common cancer in babies under the age of 1 year. Neuroblastoma is very rare in children over 10 years of age. This cancer occurs slightly more often in boys than in girls. The following are risk factors for neuroblastoma. All of the known risk factors are not modifiable. This means that you can’t change or avoid them. Until we learn more about these risk factors, there are no specific ways you can reduce the risk.